The French and American air squadrons in WWI had their drinking rituals, and it is generally accepted that the “75,” as the drink was originally known, was inspired by wine and spirit combinations put together by these flyers returning from battle. As for writing it down, recipes that formalized the 75 didn’t appear until after the war. The first was published in 1922 by Harry McElhone (ABC of Mixing Cocktails) . Robert Vermiere (Cocktails, How to Mix Them) also published a version, and attributed the drink to McElhone. The 75 seems to have fired the imaginations of the post-war European drinking public, and of their bartenders; the 75 provided a popular departure point for experimentation. 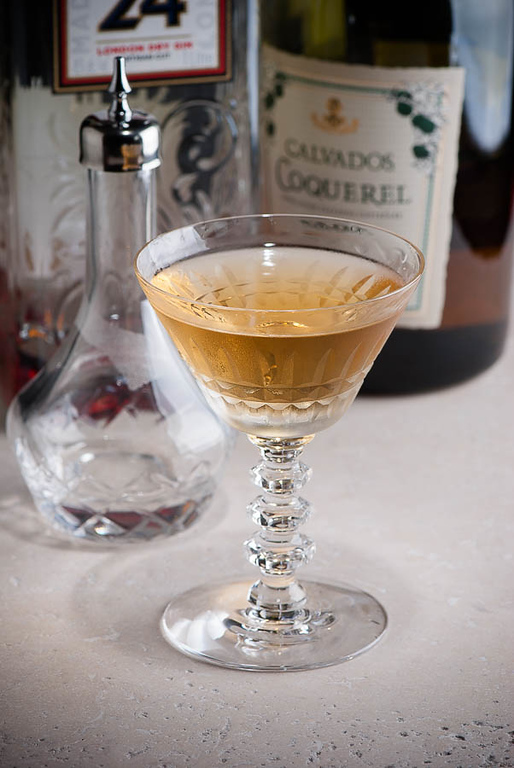 In the earliest recipes, the 75 is usually a formulation of gin and Calvados brandy, typically with a bit of grenadine or absinthe (or both) to dress it up a bit. Ingredients came and went. Already in 1922, Vermiere had added a bit of lemon juice, and it wasn’t long before the 75 began to take on the appearance of a gin sour. The biggest experiment of them all, the change that turned the original, high-test cocktail into the drink we know today, came in 1927, when Judge Jr. dropped the Calvados altogether. In Here’s How (1927), he published a version of the 75 that called for gin, sugar, lemon juice, and champagne. The 75 had morphed into something completely different from McElhone’s original: a Tom Collins made with Champagne instead of soda. All that remained was the name change. “French 75” we owe to Harry Craddock and his Savoy Cocktail Book (1930). Craddock essentially republished Judge Jr.’s 75 Cocktail, but, for whatever reason, embellished the name. The original 75 recipe? It’s mostly disappeared from modern cocktail manuals. Which is sad—it’s a really good drink, more potent and more complex than its evolved successor. I recommend that you use at least a VSOP Calvados. The brandy drives the flavor here, so the better the brandy, the better the drink. It’s too bad that the 75 is so rarely encountered in the wild—this is a delightful and flavorful drink. Shake gin, lemon and sugar with ice until well-chilled; strain into an ice-filled highball or Collins glass. Top up with champagne. Optionally, garnish with lemon and/or brandied cherry. This is Tom Collins in a tuxedo. Plymouth gin works well in this drink; it’s not as juniper-forward as the classic London dries, and so a bit friendlier to the champagne. The champagne portion is considerable, so it has to be something you would enjoy drinking on its own. Sweetness would not be a good thing in this drink, so a brut is a good choice. (Alternatives like proseccos would likely be too bright, and too sweet for the French 75.) 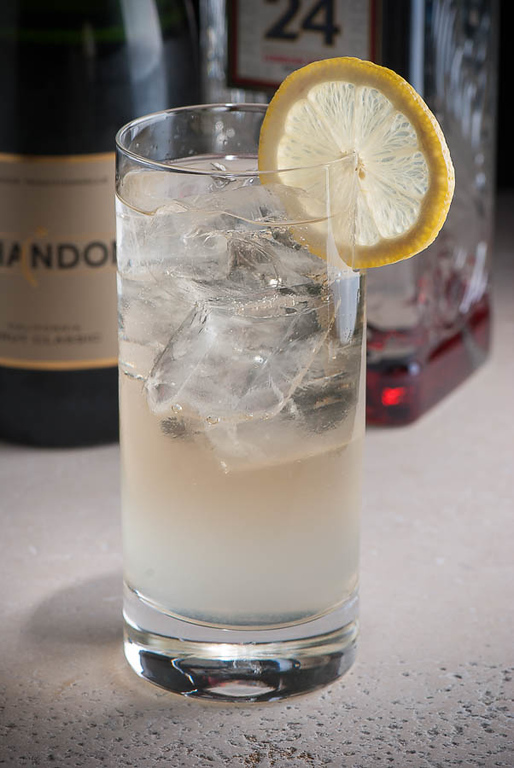 The idea is to put a little sparkle into the underlying gin sour; don’t stint on the gin and lemon, or the drink will seem lifeless, stuck between a watered-down gin sour and sullied champagne. “The French 75 Cocktail — Tom Collins in a Tuxedo” at cold-glass.com : All text and photos Copyright © 2012 Douglas M. Ford. All rights reserved. Ooooh! One of my favorites!! I always like it when I discover a favorite. Thanks for letting me know! My pleasure. I had never tried it before I researched this article; it was a very enlightening discovery. Around here, we’ve seen served at several bars a ‘French ’76’ – decreasing the sugar, and splitting some of the gin with St. Germain. Its kind of a cross of the St. Germain cocktail with the French 75. I’ve enjoyed all 3 (French 75, St. Germain Cocktail and French 76)… But I’ve yet to have the non-champagne based French 75. Must do. The “76” is an intriguing idea, supplying the sweetness with St. Germaine. I’ll have to give that a try. Thanks. Was that the French and Americans separately or together coming up with this concoction? I have to say that the original recipe appeals more to me as I am not a big lover of sweet cocktails. Interesting you should ask. Apparently it was part of the WWI fighter pilots’ culture to “unwind” after combat, in gratitude for their return, and as a farewell to those who didn’t. Over time they developed their rituals and traditions. Some would drink champagne, some cognac, some gin, certainly whatever was available. The Franco-American Lafayette Escadrille was no exception. One story has it that the first 75 (or its prototype) was made by a French flyer named Raoul Lufbery (there are many spellings of his name). There seems to be nothing to support the conjecture, but it is a satisfying story that people like to tell. Let’s say I have a bit of a professional interest: husband in the RAF and my first bit of work in England involved the US Second Air Division Association. ALthough wrong war, I’m sure there must be similar stories. Maybe you should do a salute to military cocktails? Yes, I would say that’s a professional interest. A salute to military cocktails is a very interesting theme. Perhaps I’ll do just that, thanks. I ordered a French 75 on a whim during a vacation, and have been trying to recreate that flavor ever since. Definitely a favorite — I’m excited to see if your recipe tastes like it was made for me that night. Thank you for sharing! I love reading the history of all these drinks. It’s fascinating. I just discovered the French 75 and being a fan of gin I immediately fell in love. The French 75 is a good thing to discover, and share. I’m glad you enjoy the history, that’s one of my favorite things about these drinks—there seems always to be a story. Delicious! I had a few sips of the 75 Cocktail made exactly as you described. Loved it. Then I expressed a lemon peel and rubbed the rim. Heavenly. Have you tried garnishing it that way? Hi, Raphael, I do prefer a lemon garnish, but I don’t recall if I’ve done the part about rubbing the rim of the glass with the peel. I’ll try that next time. Thanks for commenting!